nearby the entrance as well as in the precinct. 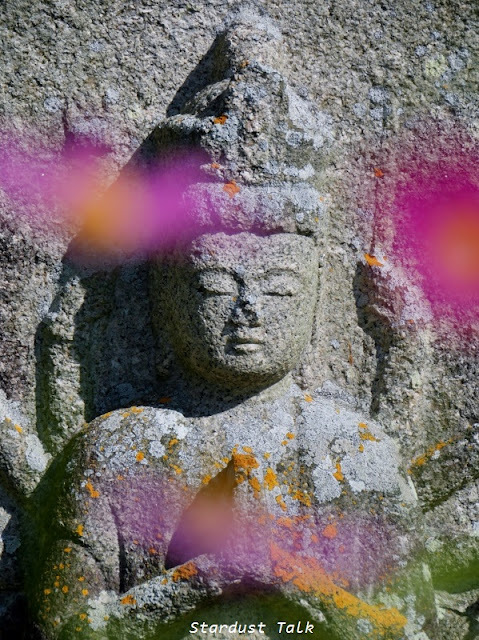 Cosmoses play around the Buddha image or Bodhisattva images. and made them look wearing translucent pink cosmos-veil or feathery green veil. in the entire Mahayana Buddhist tradition including Japan. or to remove all egos completely which prevent us from waking up to our true heart. It's not easy to understand because it is about the "emptiness" in a nutshell. Neither to practice it, because human species have not only sentience but also reason. as the last words say, "Don't worry, everything will be fine." which I have perceived from the teachings. That way, I would be able to live positive. Look around the pastel flowers floating in the light or dancing in the breeze! The ephemeral, wispy cosmoses look free and comfortable from the buds to the withering. 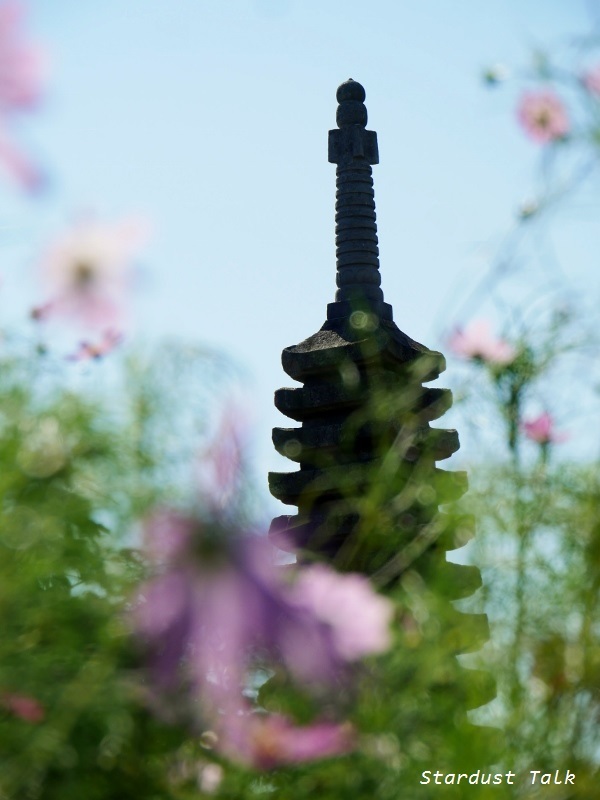 According to the Kegon Sect of Buddhism (like Todaiji- Temple), each of us has a seed within us. What we are supposed to do is to grow the seed to bloom beautifully someday. No comparison, you don't have to be Number One because you are already Only One. This flower has the same name with the Universe. Origin is "Kosmos", the Greek word for harmony or ordered universe. Hannya-ji is a small temple located at the top of Nara-zaka (Nara slope), part of the old highway connecting Kyoto and Nara. It has prospered as a study temple of the Heart Sutra repeating prosperity and declines including the catastrophes of being burnt down in 1180, 1490, 1567 and severe damages caused by the anti Buddhism movement in the early Meiji Period (1868-1912). 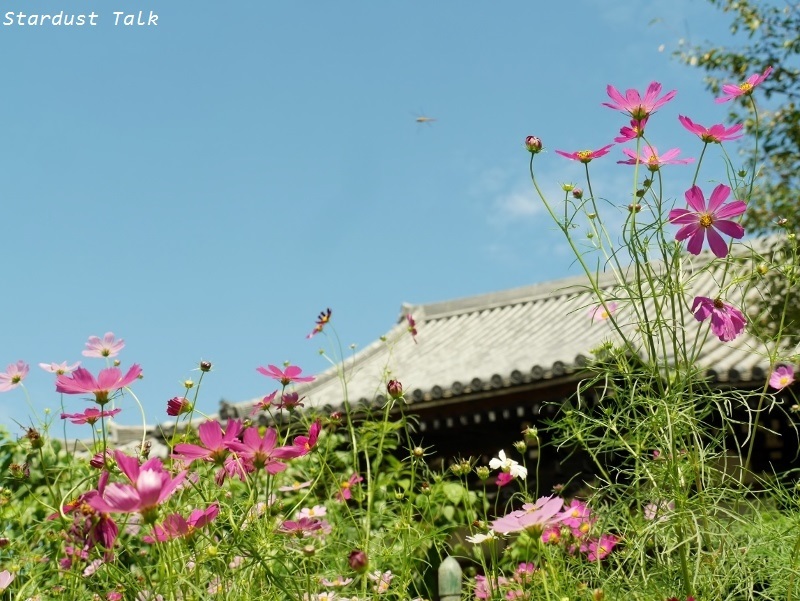 The precinct of the Hannya-ji Temple is transformed into right yellow color in spring. Your images are so uplifting and cheerful. Such a lovely walk through the garden. The pefect pictures to start a zen weekend ! so beautiful. thanks for sharing the joy. 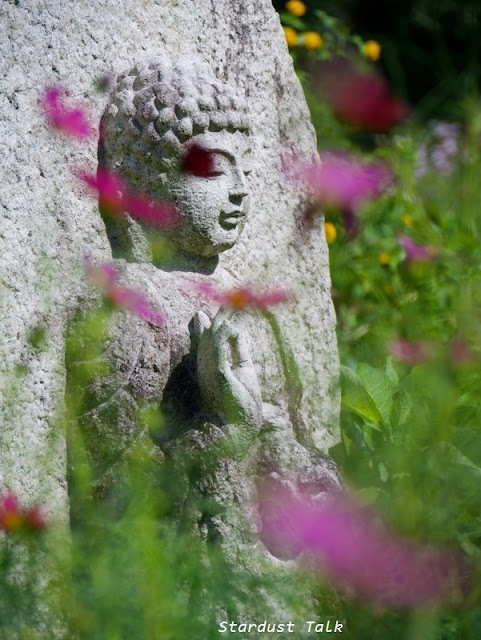 I tend to gravitate to the serene faces of most Buddha images … their calm expressions are reminiscent of a still lake. These gray statues amid the moths and graceful cosmos seem in an ideal setting. 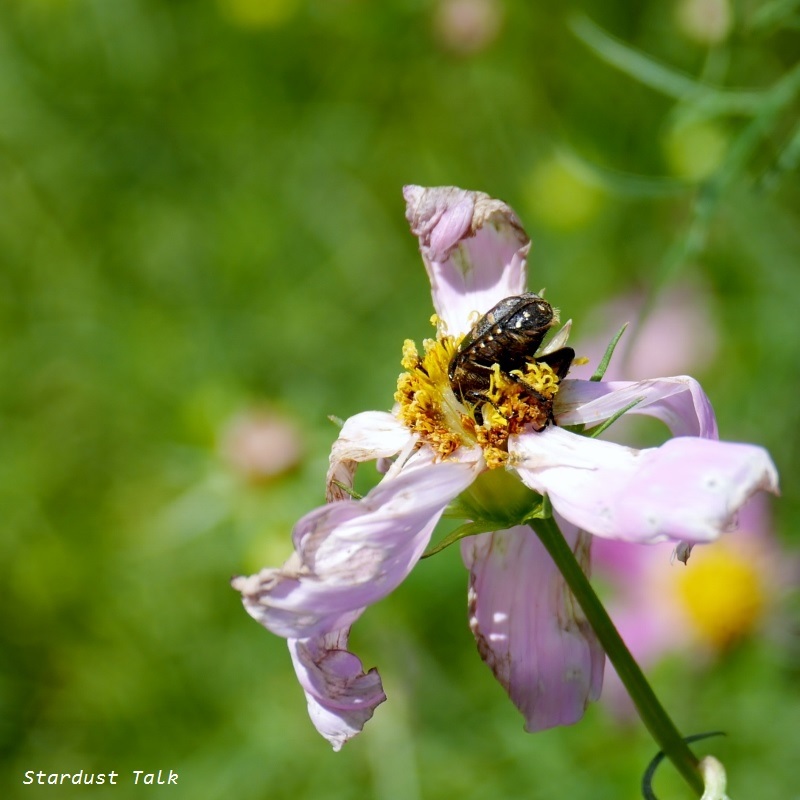 Apparently, to the Greeks the name cosmos represented beauty and ornamental order and, indeed, the statues and flowers combine like the heavenly cosmos flowing with synchronicity of their own accord without help from anyone. Hello Yoko, I am mesmerized by the Cosmos and like the focus you took bringing the Buddhist statues into sharpness while allowing the flowers to act as supplicants. I think this is a wonderful teaching, "you don't have to be Number One because you are already Only One." I would like my grandchildren to carry this thought in their hearts. 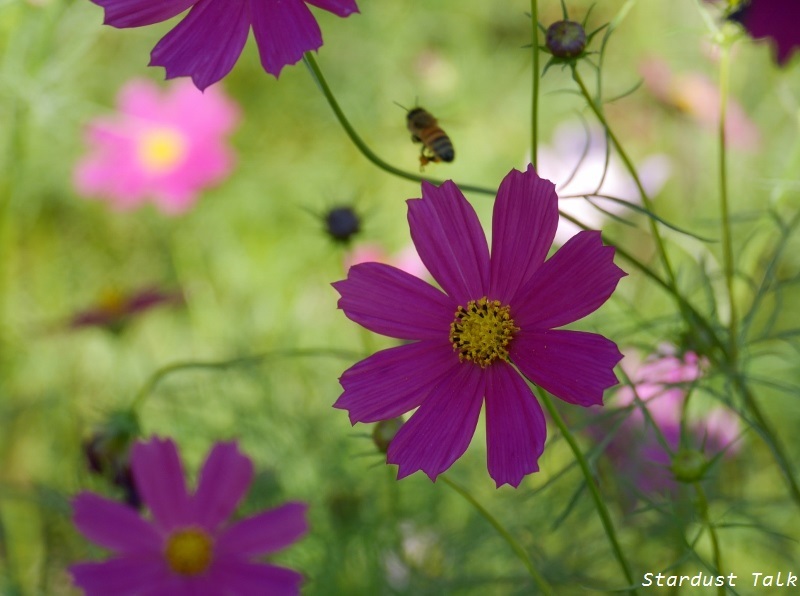 This spring, Cosmos were planted in a new median coming into the town of Breckenridge. They are still very pretty this fall. Now, when I see them, I'll think of you! Thank you for this posting. Its beauty, both visually and with words, brought tears to my eyes. Just wonderful. I bow to your ability to communicate such wonder. Thank you, Mary, for your kind words, and your comment from time to time. I always enjoy reading your reaction. Have happy days ahead. "Don't worry, everything will be fine" - I live by that day in and day out, we say in Hebrew; "Al tidag, hakol ihije beseder". I try to be positive every day, even when there are black clouds on the horizon of my life. Beautiful flowers and a lovely temple. Thank you for these lovely photographs. I love all those different shades of purple. 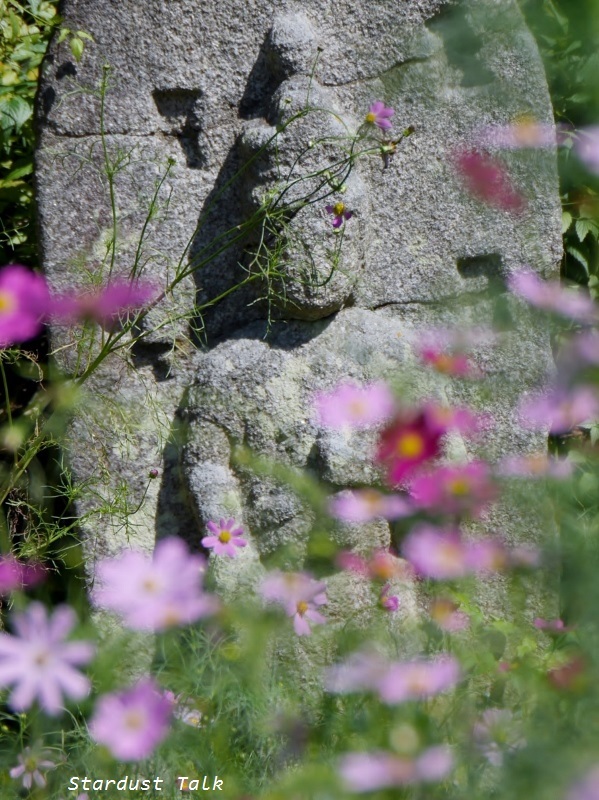 I like the way the flowers are flowing and giving Buddha's statue a gentle gift. His statue deserves the flowers. I admire how you were able to capture the light. Your delightful photos once again lighten the heart and free the mind. There is so much beauty in Nara. An interesting coincidence happened earlier today ... I was reading some passage somewhere and it spoke of glorious Nara. Re your questions about my Ocala post. I'm sorry, but sometimes my "jokes" have to do with the vagaries of the English language or American customs. The reference was to Big Brother, the "government" who watched over everyone in the book, "1984." The speakers broadcast many programs of an extreme right wing position, including the Rush Limbaugh show. Camera are everywhere to keep watch on people. If you've seen the movie, "The Truman Show," you'll know what The Villages feels like. Hope you are doing well. I've contracted shingles (neglected to get the shot) and it's very painful. So, I'm rather unhappy with my health at the moment, but it will go away in a few weeks. I hope! 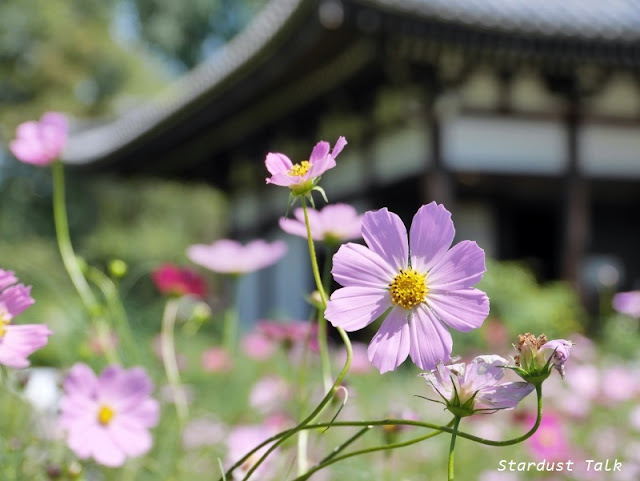 NOW (finally) I've found some time to write a comment to your enchanting post about the Cosmos Flowers, you call the "pastel-colored dancers in the autumn breeze", Yoko. 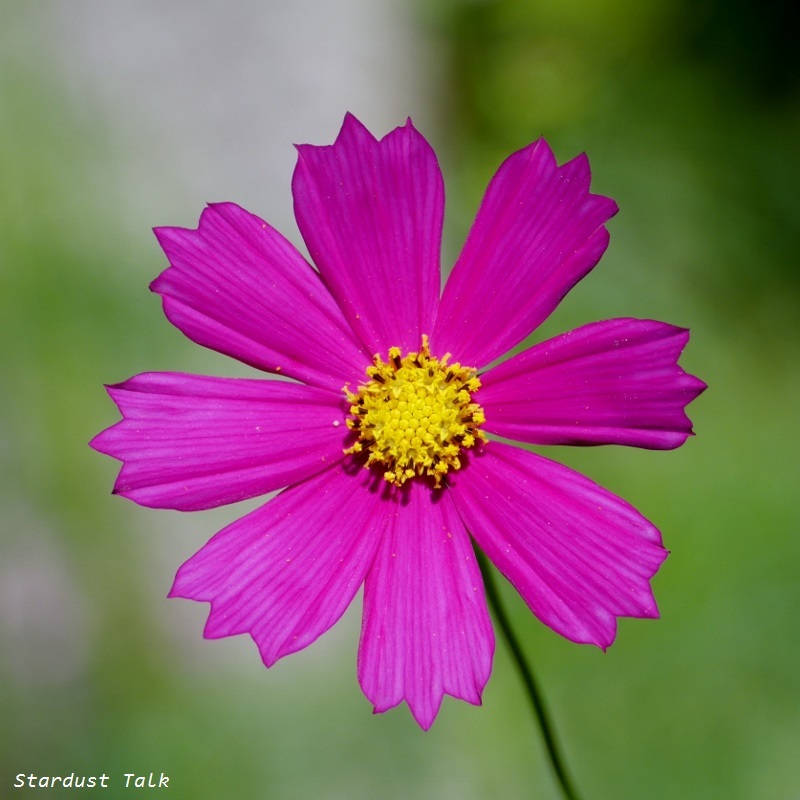 I took my cosmos blossoms and the other flowers in the cottage garden still in a very warm late summer breeze. But the summer is already gone and we are enjoying a more or less pleasant early autumn feeling currently end of this month. 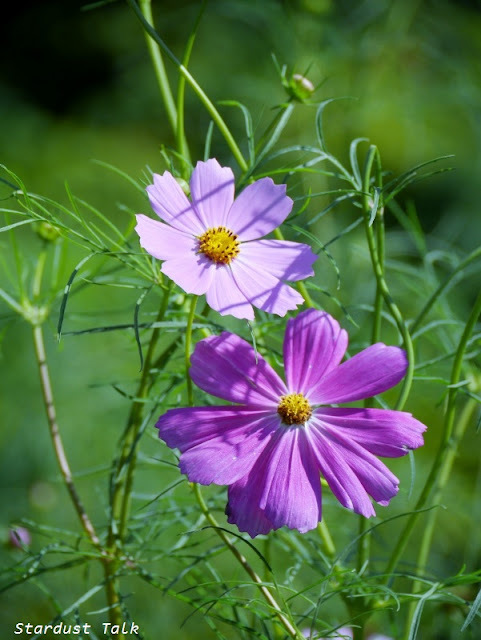 Lucky coincidence or any other higher power that we both posted cosmos flowers at the same time, Yoko? Interesting to see that each of us has his or her own way to present these floral beauties in the proper light. Your first photograph with the buddha statue is my personal favorite. 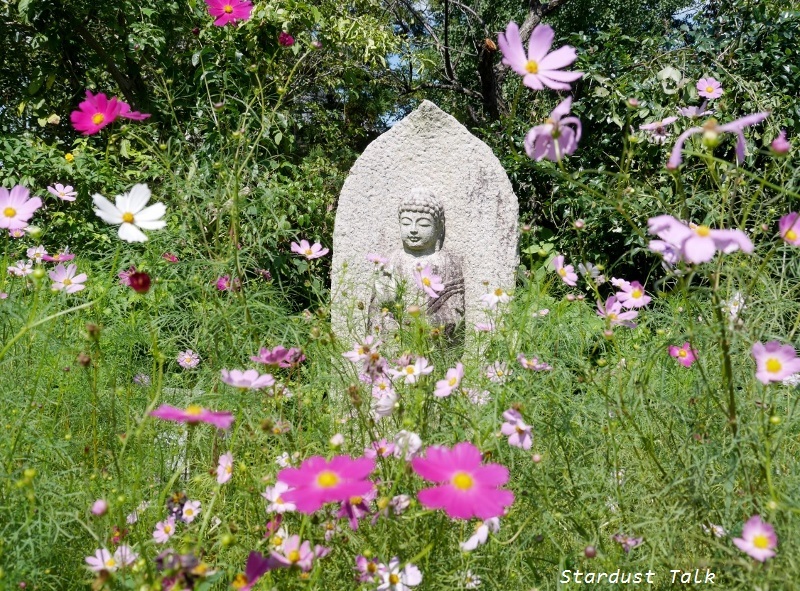 The buddha stone on the green field, surrounded by flourishing cosmos plants fits perfectly together! Enjoy a great weekend with your loved ones, Yoko! Hey! 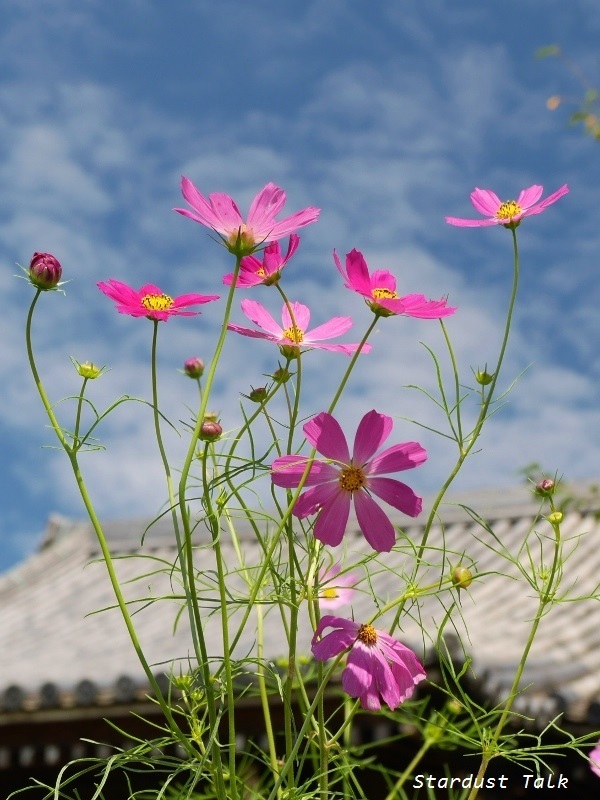 The pink-purple flower looks pretty against the blue sky :) And you're right, the gloomy weather gave Himeji Castle a different effect. I would love to go back during sunnier weather. So I can also check out the Kokoen Pond. What a magical place,I'd love to see such a profusion of cosmos. I love the way you've caught the blur of waving flower heads like splashes of paint. 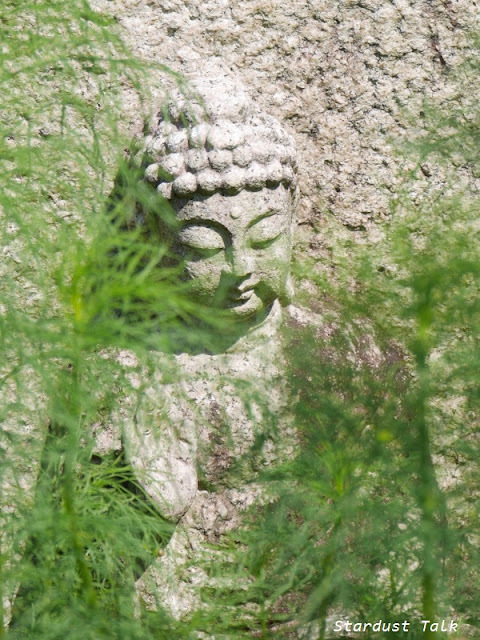 The Buddha brings peace to the garden and it's visitors! Your way to live positive echoes in my heart. Thanks for a leisurely contemplative walk, I loved it! Ethereal, dancing, floating, visions of floral beauty amidst the more solid, somber statues. A gorgeous post. 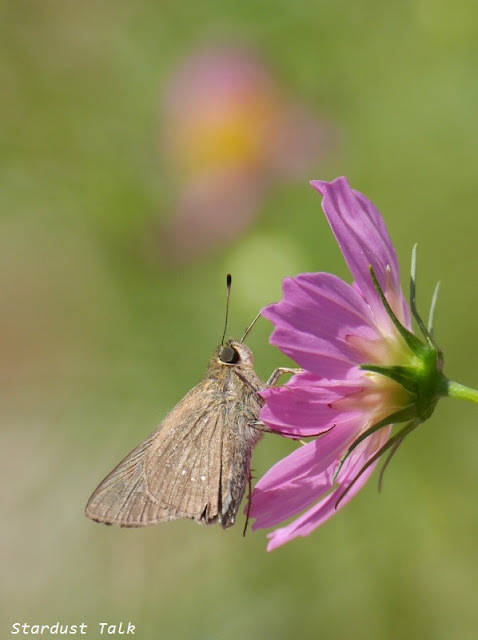 And thank you for all of your comments on my blogs and for your positive note in this post. I tend toward the more negative side of things, which, I think, is less healthy overall. Woooow!!! After reading these texts and seeing these instantaneous they give desire of putting to dance accompanying these figures. Undoubtedly we will not find more suggestive and delicate veils for it that the optical effects that the games of light provoke between these flowers.